Wool fabrics from some of our favorite sources. 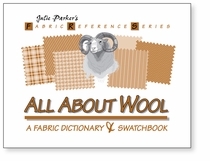 This is an updated version of the source list in our book, All About Wool: A Fabric Dictionary & Swatchbook. We update the list each time we print the book, but as soon as the ink is dry, something changes. We no longer sell the updated source list because we can post it here for free. This list was updated Oct. 8, 2013. Wholesale source of many types of woolen and worsted fabrics, especially men's suiting fabrics. Huge inventory, low minimums. Qualified buyers only. Toll-free: 800-433-1546. Wholesale source of sewing and pressing equipment and tailoring supplies. Free catalog, $25 minimum order. Retail fabric store carries wools imported from Europe. Custom sampling available to mail-order customers with special requests. Write or call for more information. Toll-free: 800-543-0355. Retail store that buys fabrics from New York's top clothing designers and manufacturers. Wide selection of fashion fabrics in all fibers. Wool fabrics include barathea, cavalry twill, challis, coating, crepe, double-faced, flannel, gabardine, herringbone, knits, lamb's wool, melton, merino, suiting, tartan plaids, tropicals, tweeds, cashmere and mohair. Offers specialized swatching services and seasonal mailings to members of swatch club. Phone: 203-846-1333. Four-floor retail store – with floor-to-ceiling displays of fabric – is worth a visit if you are in the neighborhood. Small fee for custom sampling to mail-order customers who provide very specific details about the types of fabrics they seek. Send a long, self-addressed stamped envelope for more information. Phone: 415-392-2910. Wide variety of fabrics of all fibers, including wool knits and novelties. Many fabrics are from designer cutting rooms. Inventory changes quickly. Phone and fax: 215-542-1082. Source of 100 percent wool felt imported from Germany. Sells yardage and pieces in three different weights and thicknesses. Also sells felt items such as placemats, coasters and table runners. Samples available for a small fee. Phone: 617-391-6230. The Harris Tweed Association, Ltd. Non-profit organization that serves as guardian of the trademarked orb mark and source of information about Harris Tweed and the weavers who make this famous cloth. Write for more information. Extensive selection of fashion fabrics of all fibers, plus home-decorating fabrics and upholstery. Nice selection of wools and lots of one-of-a-kind suiting and coating fabrics. Discounts available to qualified buyers. Tour buses are common at warehouse-style store – it’s worth a visit if you’re in the area. A second store is located in Beaverton. Phone: 503-786-1234. Annual fee for seasonal mailings of fine fabrics imported from Italy, France and elsewhere. Specializes in fabrics made from natural fibers, including a nice selection of wool crêpes, flannels, gabardines, coatings and one-of-a-kind suitings. Oversized samples are nicely presented and packaged with care so you won’t get them mixed up. Also offers thread and button matching services. Service is friendly and fast. Phone: 978-368-3133. Independent fabric store with two floors of mostly natural fibers, including hundreds of wools in many different weaves and colors. Swatches available. Phone: 510-845-6106.